CELEBRATING 130 YEARS, BULGARI IS OFFERING THIS SPECIAL EDITION WHICH IS FITTED WITH A ROSE GOLD PLATE ON THE CASE EDGE ENGRAVED WITH "1884" THE YEAR OF BULGARI'S INCEPTION. Matte finished black carbon case. 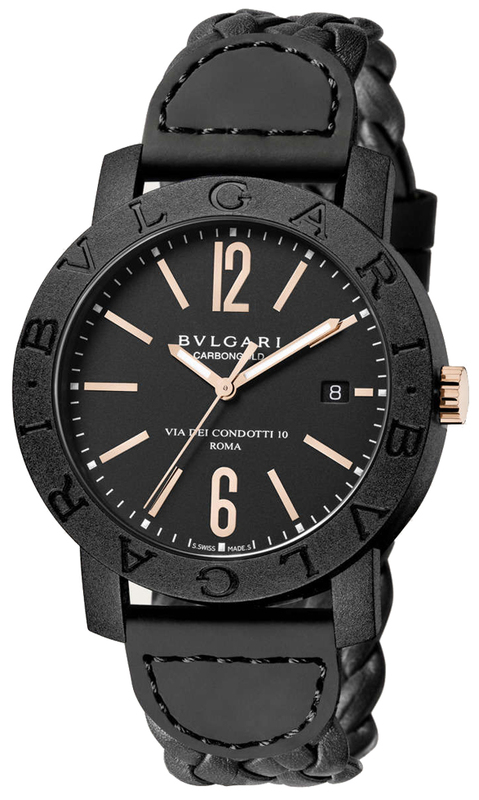 Matte finished black carbon bezel engraved with the iconic BVLGARI•BVLGARI logo. Applied polished rose gold toned hour markers in a combination of indexes & Arabic Numerals. Automatic/self-winding movement with a 42 hour power reserve.